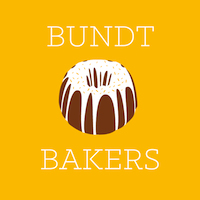 Time for August's #BundtBakers! This month's theme comes from Teri at Love and Confections. The challenge: Sprinkles off all sorts! Jimmies, colored sugar, nonpareils, dragées, candies, pearl sugar, etc. If it can be sprinkled and used to decorate a Bundt, inside and/or outside, it's fair game. Seriously, Teri! What a fun theme! And THANK YOU for hosting! I had no problem deciding that I was just going to go 'heavy handed' with rainbow sprinkles and make a 'Celebration' Cake. What are we celebrating? A problem house on my street (so many people came and went we did not know who actually lived there) had a visit (dawn raid) from some nice people (federal agents) to encourage them to have better manners (not sure exactly what the bad manners were, but someone landed in jail). And that's all I'm going to say about that because federal agents tend to be very tight lipped about their investigations (they would not divulge any juicy details). 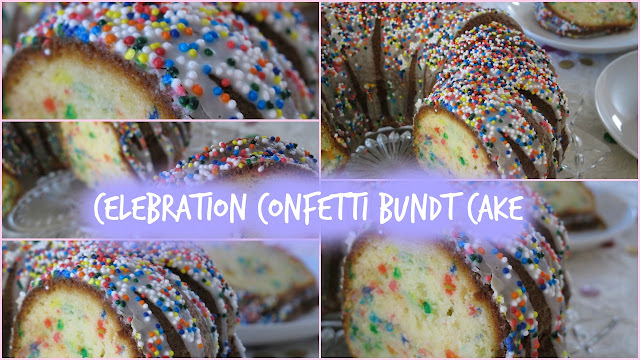 Pop the champagne and bring out the Celebration Confetti Bundt Cake!!! It seems all the people who came and went from the problem house have moved out! "I'm living life to its fullest." What do you have to celebrate??? Prepare bundt pan with shortening and flour. Blend cake mix with pudding mix until well combined. Add eggs, oil, 1/3 cup almond milk, and yogurt. Blend 30 seconds on low speed of electric mixer. Scrape bowl. Mix 2 minutes on medium. Bake 50 - 60 minutes or until wooden toothpick inserted in center of cake comes out clean. Cool 10 minutes in bundt pan. Remove cake from pan and cool completely on wire rack. Combine confectioner's sugar with 2 tablespoons almond milk. Drizzle icing on cake and top with additional rainbow sprinkles. Sounds like a fun project and who doesn't love sprinkles! You used them well - the cake looks festive and delicious. Definitely a cake for a celebration, especially one for kids. How colorful. Definitely something to celebrate about! Love all the sprinkles! So many wonderful things to celebrate, getting back your neighborhood, hosting your daughter's summer reading club, being called a pet unicorn by a youngster....and the perfect cake with which to do so. Such pretty sprinkles on your bundt, looks so fun and inviting! Love the look of your bundt cake - it looks stunning. Such a pretty cake! I am glad your problem house is not a problem anymore! Definitely sounds like a reason to celebrate with cake! Love those sprinkles! It's a gorgeous cake and I'd love a slice! This cake alone is cause for celebration. What a beauty!! Interesting goings-on in your neighborhood! What a shame those Feds are so tight-lipped because It sounds like that would be quite the story. It may not be cool but I think hosting a book club for your daughter is fabulous! That cake is perfect for the occasion! Thank Goodness for the clearing out of the elements from your neighborhood. It is cause for celebration and so is hosting summer book club! You are a cool mom to bake such a FUN cake! what a lot of sunshine there is in that cake! How scary to have people like that living in your neighborhood! So glad they're no longer there and a very good reason to celebrate. Your cake is so pretty and 'happy' indeed. I've never made a bundt cake before, this one looks delicious. I like what Lavender & Lime said - a lot of sunshine in that cake... and happiness, too! Very Beautiful Bundt, you have it there. Lol, I too was a little "heavy handed" with the rainbow sprinkles, but I like your round ones much better than mine! Your cake looks delicious :). I wish I had a book club growing up! I should start one now. It's a good reason for cake! I bet the kids did love this one. So cute!! So fun! Love the sprinkles in and out of the cake.